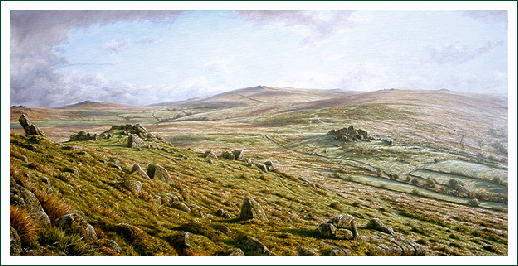 Mayflower Arts now displaying two Dartmoor Paintings. I have just started exhibiting my paintings at a new gallery in Plymouth, Devon. What was Armada Gallery in Plymouths famous Barbican area, is now under new ownership under the name of Maylower Arts and is being run in the capable and very friendly hands of Zuzana and James. They have revamped the gallery and it now displays a wide range of high quality work. I have displayed two oil paintings of seascapes. 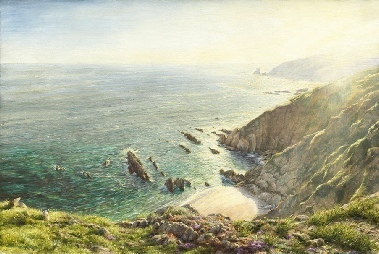 They are both of the Portwrinkle area of coast and I would urge you to go and see them for I am particularly pleased with outcome of both paintings. For contact details of Mayflower Arts click here. 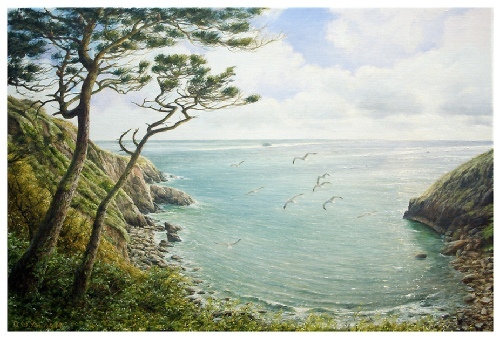 I have started the new year with the release of a new oil painting of Pudcombe Cove on the South Devon coast. A delightful path meanders down a wooded coombe from the National Trust property of Coleton Fishacre to this secluded and perfectly formed little cove. I have attempted to convey the subtle variations of colour that appear in the almost tropical waters of the Cove. A small flock of seagulls gliding over the Cove give a sense of space and height. If you are interested in the painting please don’t hesitate to contact me and we can talk about it in a little more depth. I have just completed a major oil painting of Dartmoor entitled 'Ten Tors'. The painting includes, as the title suggests, ten of Dartmoors Tors. These are Holwell Tor, Hay Tor, Saddle Tor, Rippon Tor, Top Tor, Pil Tor, Hollow Tor, Bonehill, Bell Tor and finally Chinkwell Tor from which I painted the view. Welcome to my new website of seascapes and coastal paintings that will hopefully compliment my existing website of Dartmoor and landscape pictures. In the course of time I will be adding new pictures of the South West coast to this website so keep a lookout for that special view that you always wanted on your wall! I have tried to make this new site as enjoyable and easy to use as possible. The pictures of course take centre stage and I have endeavoured to make them as large and clear as possible. I have also added the feature of showing the prints in the different frames. I hope this will make your choice of frame a lot easier. 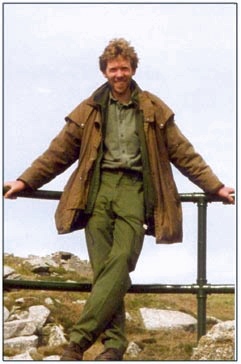 Of course, if you wish to contact me about anything I will be more than happy to oblige.